I’ve never eaten Cheestrings before, so this was a new experience. That’s partly what this blog is all about. Trying new experiences and sharing them with others who may wish to do the same. First of all I’d like to point out that’s not how “cheese strings” should really be spelt. That aside these aren’t cheese strings anyway. On opening the packet they were small blocks of dark and light yellow cheese rather than strings. These I supposed may be akin to Red Leicester and Cheddar Cheese. In the packet there were also varying shapes of salted crackers, mini blobs of digestive biscuits, chocolate coated raisins and dried sweetened cherry strings. The cherry strings really were strings as opposed to the cheese blocks which were as previously mentioned: blocks! I mean really, if you’re going to call a product Cheestrings (however badly spelt) I would have thought the manufacturer would have felt obligated to put ‘cheese strings’ within the product. Anyway, I thought Cinabar was joking about the cherry strings when I “liberated” this packet of Cheestrings (Cheesblocks) Snack Mix off her, but there they were. I do hate cherries, so I suppose that’s my fault for jumping over the hedge before looking at what’s on the other side. The cardboard sleeve covering the snack seemed to imply a suggested way to eat the Cheestrings Snack Mix would be to mix them up stacked on each salted cracker. Phah! What madness is that…? I’d prefer to try all components separately if you don’t mind! On taste the darker yellow cheese tasted just like Red Leicester to the point that I figured it probably was Red Leicester. That’s a boon, because I do love Red Leicester Cheese, and as an aside I strongly believe it’s the best cheese for ‘cheese on toast’ (you can leave comments below if you disagree)! The lighter yellow cheese tasted just like Cheddar Cheese so I suspect it probably was. I do also love Cheddar Cheese, but Red Leicester is still better on cheese on toast in my opinion. The salted crackers tasted just like salted crackers, mainly with the salt towards the aftertaste. They complemented the cheeses very well and were obviously edible with or without, but I tried them with the blocks of cheese until I ran out of crackers. That’s the type of rock ‘n roll lifestyle I lead! 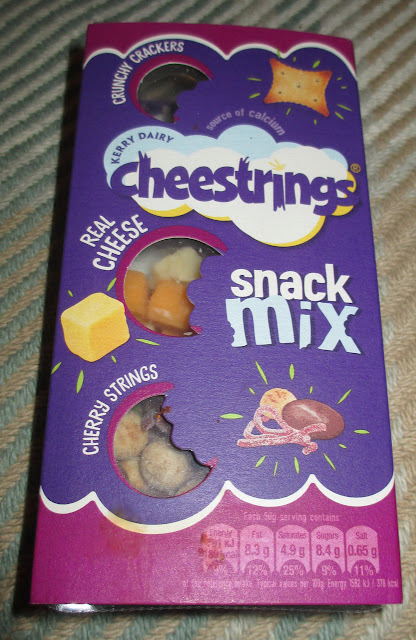 Part of me wanted to try the cherry strings, blobs of digestives and chocolate coated raisins whilst eating the cheese and crackers, but that would be just as insane as eating them before. I suppose there are two types of people; those that like jelly and ice cream in one bowl, and those that prefer them in separate bowls. I’m one of those rare individuals who like them in separate bowls. 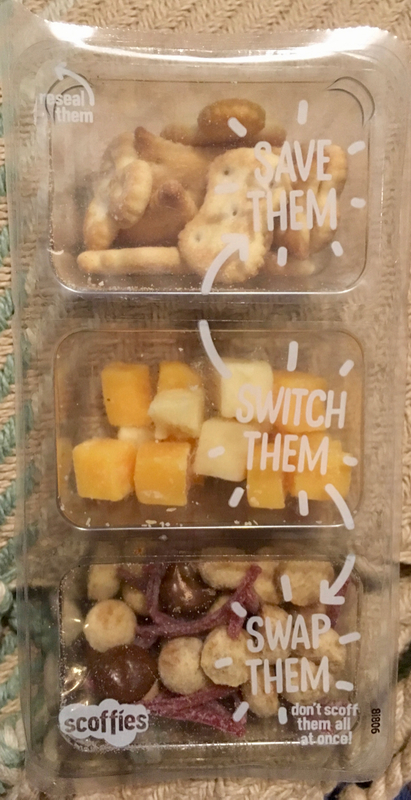 Obviously in my half-crazed mind these extra Snack Mix morsels were still meant as pudding, even with the quite frankly ‘out there’ serving suggestion on the cardboard sleeve. The digestive blobs were crunchy and sweet and there were plenty of them. In my strange mood I ate all of those next. I then started on the sweet cherry strings. There were far too many of these little red strings in the packet for my liking, however eaten piecemeal and straight after the sweet biscuit blobs they actually tasted okay(ish). Last but not least were the four milk chocolate coated raisins. They were easy to count because I’d eaten everything else. Perfect pudding material if you like that sort of thing. Personally I prefer chocolate coated fudge, but these chocolate coated raisins were actually very nice instead. I’d certainly recommend Cheestrings (Cheesblocks) Snack Mix. They’re like a lunchbox on its own for kids that would fit in a larger greedier person’s lunchbox (like me) who may wish to complement a sandwich and (crisps, tomato, apple, banana, yoghurt and chocolate bar) whatever else they may have for lunch. 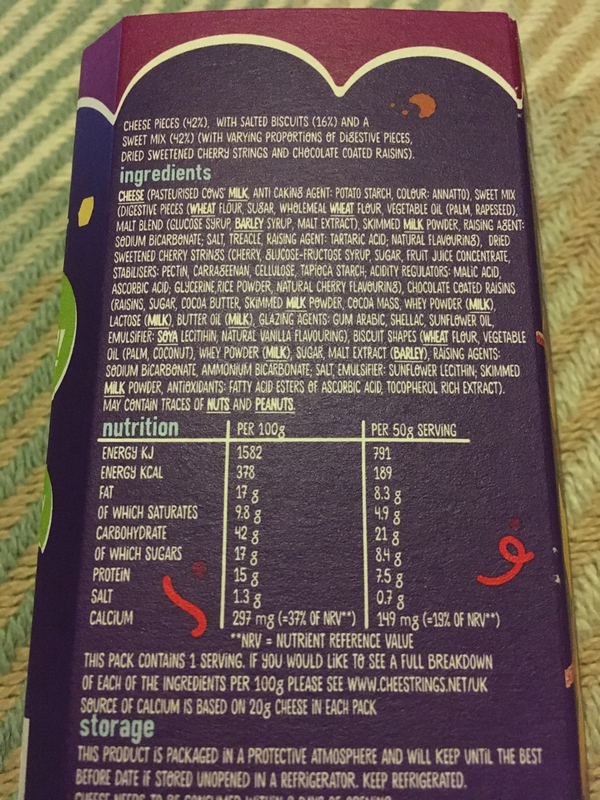 The 50g packet contained 189 calories, with 8.3g of fat, 8.4g of sugar and 0.7g of sugar. There were 42% cheese pieces, 16% of salted crackers, and 42% of sweet mix with varying portions of digestive pieces (blobs), dried sweetened cherry strings (devil’s fingers), and milk chocolate coated raisins (that looked a little like a rabbit had been caught short whilst walking over an open packet). Please see photograph for extensive ingredients.